Lakeview Pantry on Chicago's north side is one of the largest pantries in the city. Like other organizations around the city, state, and nation that provide the basic necessity of food to hungry people, Lakeview Pantry continues to experience a greatly increased need for its food services. In light of this, Lakeview Pantry set out to explore the larger systems-level issues that push its clients to seek out the pantry in the first place. 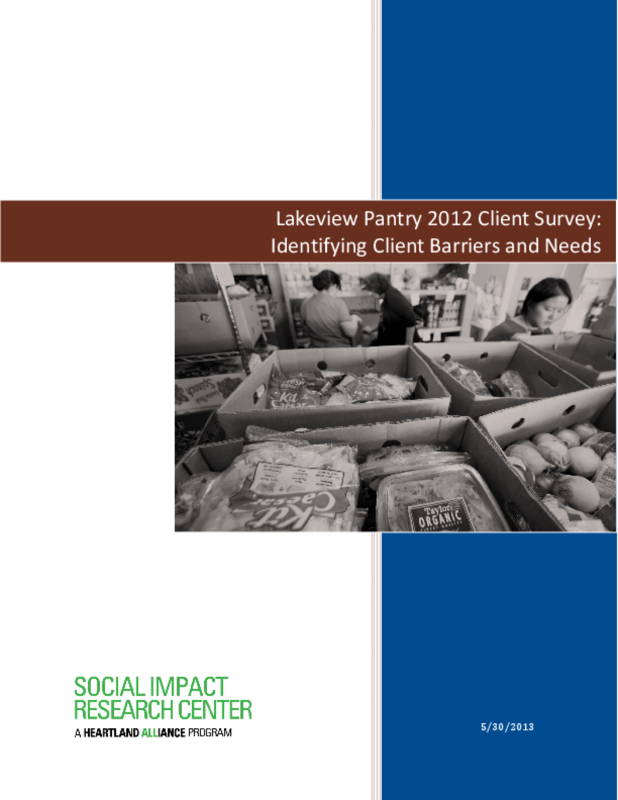 With the assistance of the Social IMPACT Research Center, Lakeview Pantry conducted a survey of 426 clients in November and December 2012. The survey helped Lakeview Pantry answer key questions -- what are the characteristics and experiences of their clients, and what challenges drive their need for services? The results of this client survey clearly illustrate that hunger and the need for food assistance are symptomatic of larger social problems: unemployment, underemployment, low education levels, unaffordable housing, income inadequacy, physical and mental health problems. 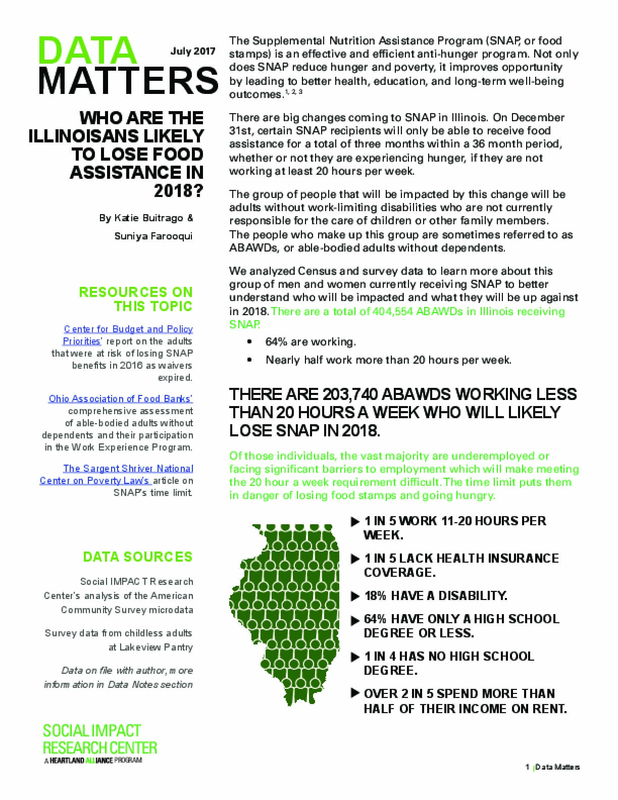 As Lakeview Pantry uses IMPACT's survey findings to be data-informed and plan its future, they are now considering opportunities to not only continue to successfully help meet people's basic needs, but also engage in advocacy work to help move clients out of poverty and ensure that new people don't ever become hungry in the first place. 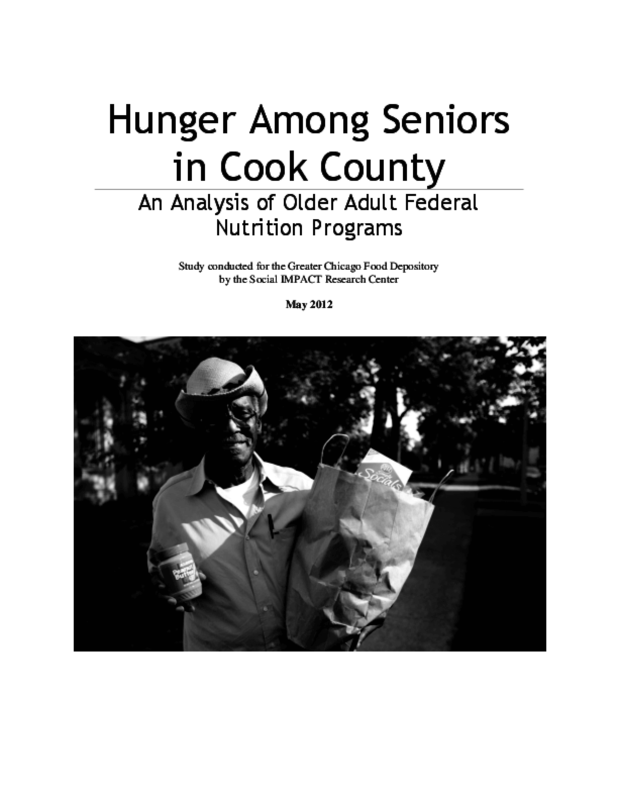 The Social IMPACT Research Center (IMPACT), at the request of the Greater Chicago Food Depository, conducted a geographic analysis of primarily federally-funded nutrition programs that target older adults. The goal of the project is to better understand what Chicago Community Areas and Suburban Cook County townships are most underserved by federally-funded nutrition programming in relation to the number of older adults likely to have need for food assistance. 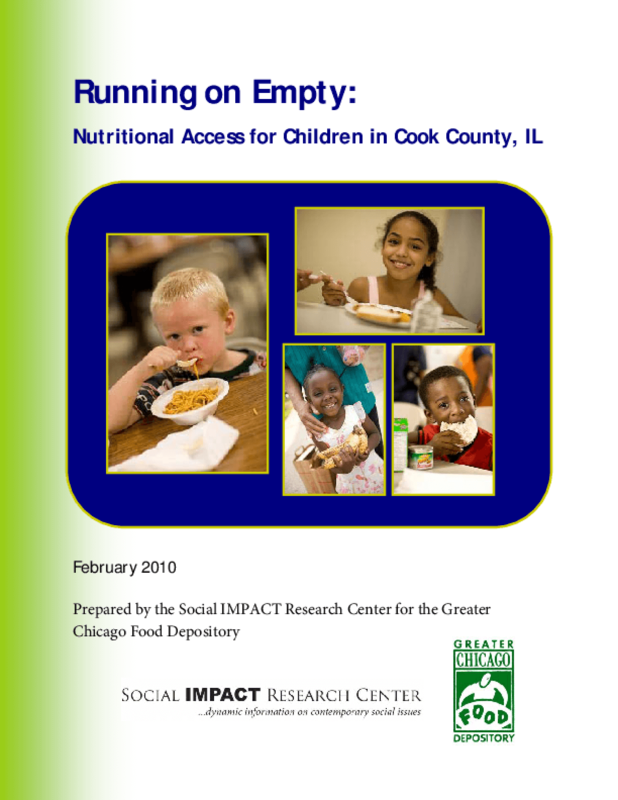 In an effort to make informed program expansion and improvement decisions, the Greater Chicago Food Depository commissioned the Social IMPACT Research Center of Heartland Alliance to conduct a study of child nutrition program coverage and child nutrition and hunger in Cook County, Illinois. This study examined the geographic coverage of child nutrition programs to identify areas that have the greatest number of unserved children and have the worst program coverage. The study also took an in-depth look at the nutritional lives of children attending summer nutrition programs. Insights in these two areas are vital to helping organizations like the Greater Chicago Food Depository make sound programmatic and expansion decisions that will best meet the nutritional and hunger needs of Cook County's most vulnerable children. 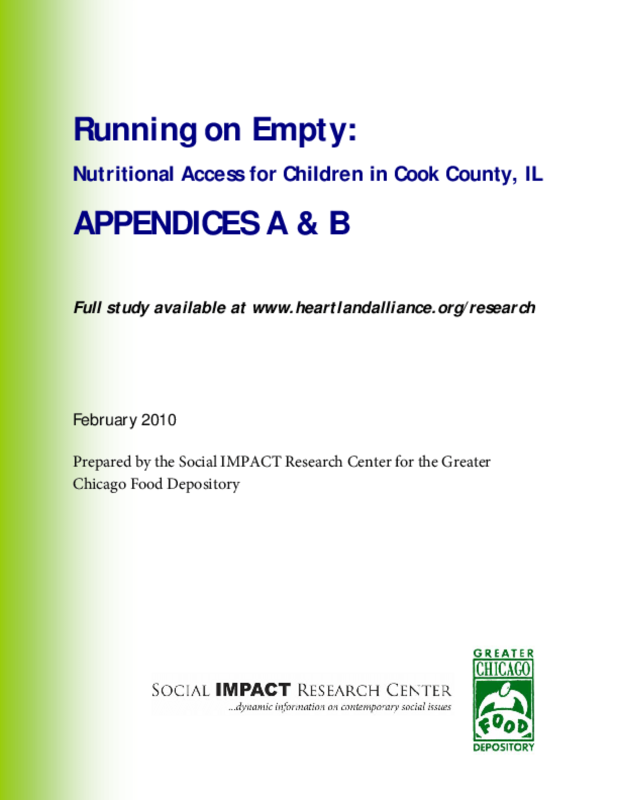 In an effort to make informed program expansion and improvement decisions, the Greater Chicago Food Depository commissioned the Social IMPACT Research Center of Heartland Alliance to conduct a study of child nutrition program coverage and child nutrition and hunger in Cook County, Illinois. ** This study examined the geographic coverage of child nutrition programs to identify areas that have the greatest number of unserved children and have the worst program coverage. The study also took an in-depth look at the nutritional lives of children attending summer nutrition programs. 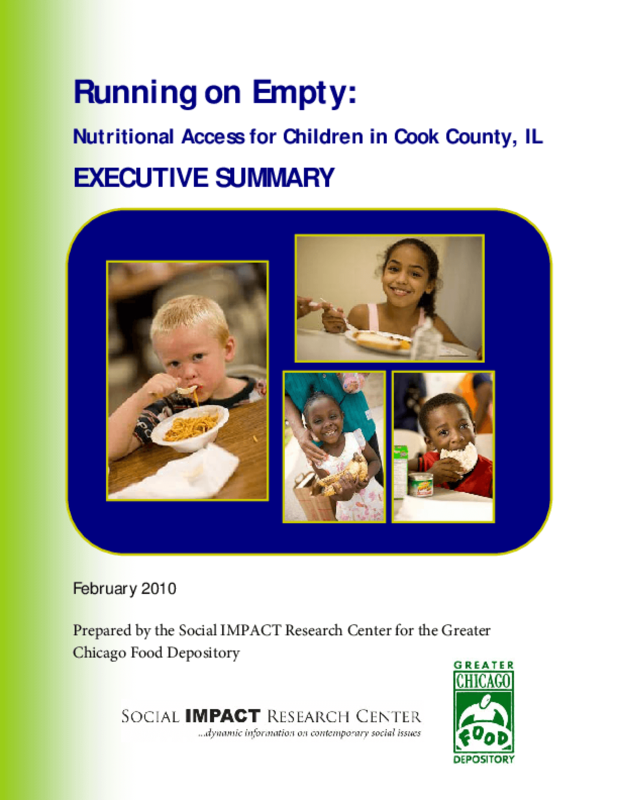 Insights in these two areas are vital to helping organizations like the Greater Chicago Food Depository make sound programmatic and expansion decisions that will best meet the nutritional and hunger needs of Cook County's most vulnerable children.